The path and name of the referenced Velocity file are shown. All Velocity files from the application package are stored in the portal directory internal/application/store/<AppGuid>/resources. Opens the Velocity file manager. An existing Velocity file from the application package can be referenced or a new file can be created. All Velocity files from the application package are saved to the portal directory \internal\application\store\<AppGuid>\resources. 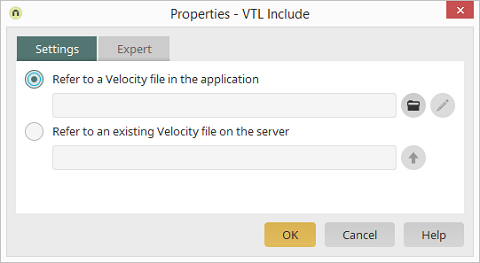 An existing Velocity file available on the server can be referenced here. Opens the Velocity file manager where the Velocity file can be selected. Velocity files that end in .vm can be called up diretly from the web using URL parameters. If necessary, permission verfications must therefore be performed in the code of the VM files, so that unauthorized access to sensitive information is prevented. The file extension .vmi stands for Velocity files. As opposed to Velocity files with the extension .vm, VMI files cannot be called up directly from the web. For this reason, security checks, which have already been performed in the calling Velocity files, do not have to be performed again in VMI files. To use this element, you need to have experience with scripting languages and ideally also in Java development. United Planet does not provide any support for the use of VTL in Intrexx.